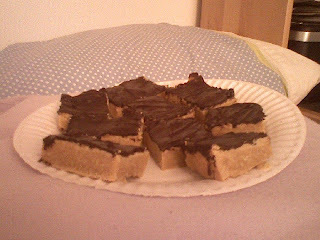 Baking and Mistaking: Toffee Bars? Well, they look pretty good don't they? And I'll be honest they tasted good too. But I may never know what they were supposed to be like. See, I made an elementary mistake the night I baked these. One I've made before, and one I'm sure I'll make again. You see, this recipe called for a 9x13" pan, and I figured, thats kind of a lot right now, I"ll halve the recipe and put it in an 8x8. Grand plan no? And it was. But like my math miscalculations before, this idea eventually had its downfall. I measured out the ingredients, took half the amount of butter, half the amount of sugar, and so on and so forth, until I read the part of the recipe that called for two egg yolks. And I put in....two egg yolks. Blissfully unaware (my general state of being) I put the pan into the oven and left the kitchen. Suddenly, about 5 minutes later, a light bulb popped on over my head. I knew I had missed something. And I couldn't take it back. Its like that scene in home alone where the mom tries to think what she could have forgotten before she left for vacation. I racked my brain, going over the ingredients in my head and them BOOM! It hit me. I'd halved all the ingredients but one. And it was too late now. Kind of like when the lid pops off the pepper container as you're adding a sprinkle to the sauce. You just want to take it back, but you can't. Anyway, I digress. The cookies baked anyway, and I melted the chocolate on top and cut them up into pieces as instructed. They were a little on the dry side, and who knows if I'll ever recreate them to find out what they would have tasted like. I'll let you know. This recipe came from The Cookie and Biscuit Bible by Catherine Atkinson, and was selected simply because I had all the ingredients already! Recipe at the end of the post. Tip of the Day: When changing the amounts of a recipe write down all your new measurements to ensure you don't slip up with one (or all!) of them. Beat sugar and butter together. Beat in yolks and vanilla. Stir in flour and salt. Spread into 9x13" pan, and bake at 350 for 25 to 30 minutes. Remove from oven and place chocolate on top of hot cookie. When it melts, spread to cover base.